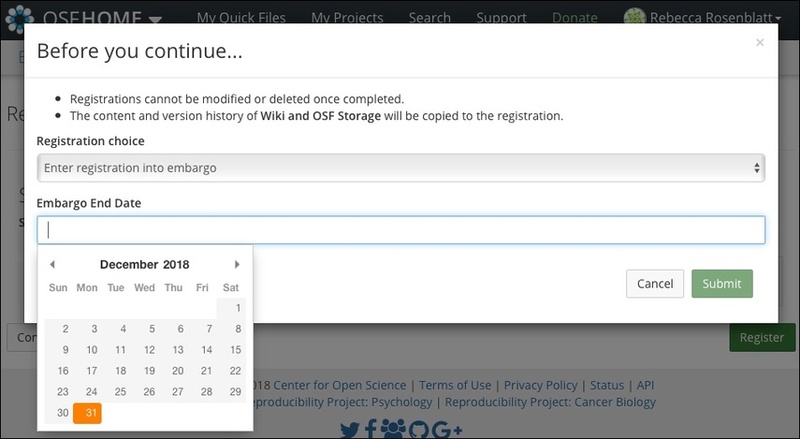 A registration is a frozen, time-stamped copy of an OSF project. Registrations cannot be edited or deleted. 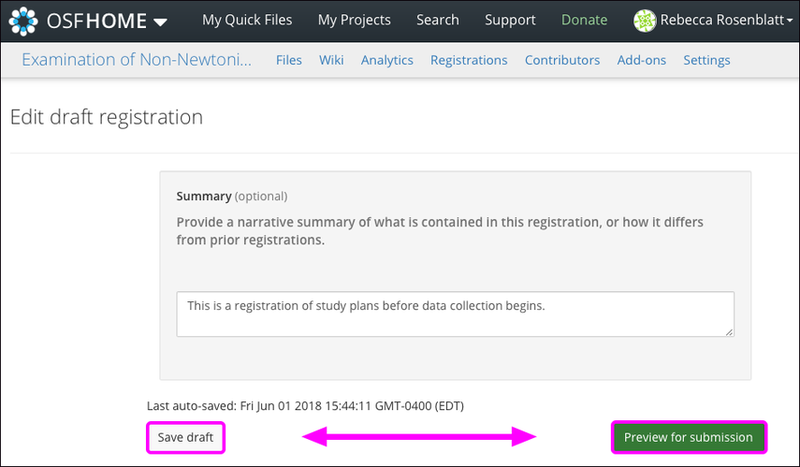 You might create a registration to capture a snapshot of your project at certain points in the research cycle - such as right before data collection begins, when you submit a manuscript for peer review, or upon completion of a project. All registrations will be made public eventually. You can choose to make the registration public immediately or embargoed for up to 4 years. Registrations cannot be deleted, but they can be withdrawn. Learn more about registration withdrawals by following our help guide: Withdrawing a registration. 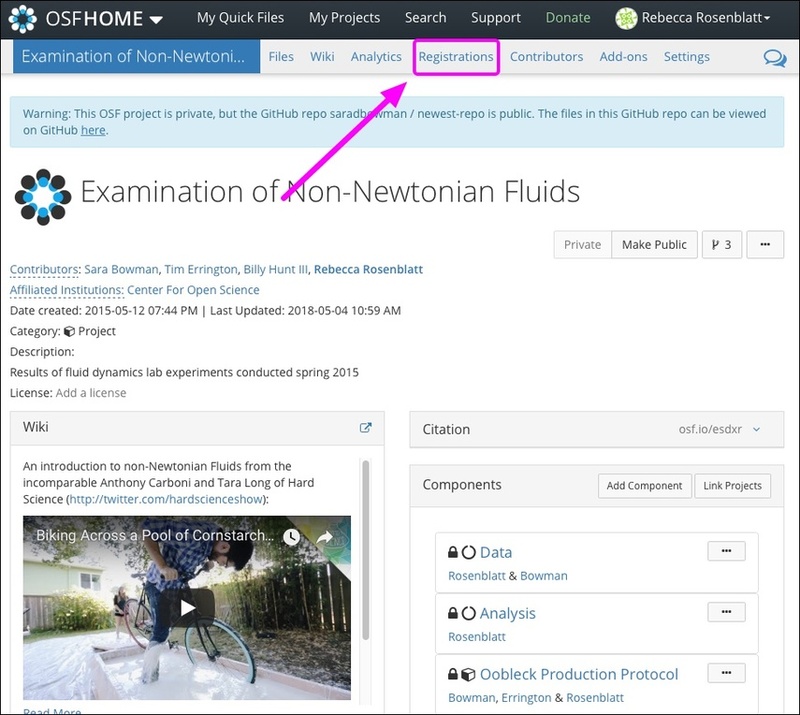 Open the project that you want to register, then click the Registrations tab in the navigation bar. The "Registrations" page will appear. Next, select the registration form that you want to use. Hover over the i icon to read a description of each form. See the Registration Forms help guide to learn more. Then, click the Create draft button. Each form will ask you to enter information about your data and research. You can save your form as a draft and revisit it later by clicking the Save as Draft button. Learn more at Save Your Registration Form as a Draft. Click the Preview for submission button when you're ready to register. If the registration form is more than 1-page long, this button will be at the bottom right of the last page. Review your registration form. 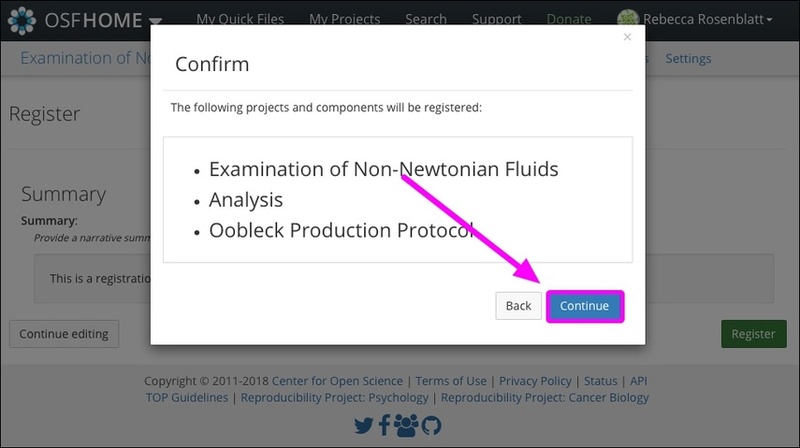 Click the Continue editing button to make further changes. Click the Register button when you're ready to register. 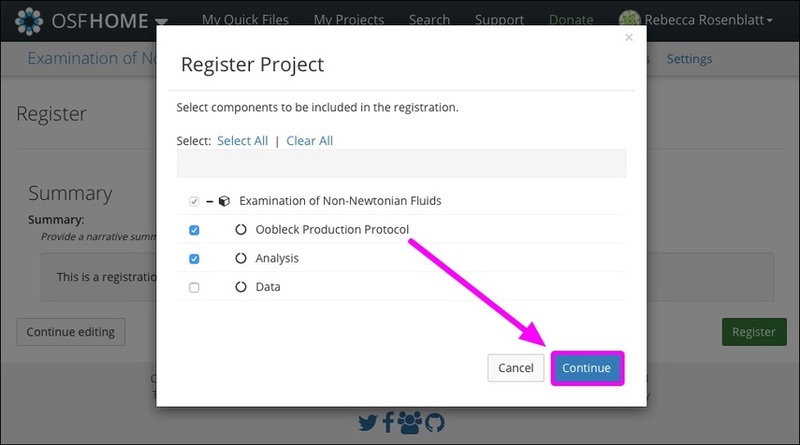 If your project includes components, you can select components to include or exclude from the registration. As all registrations become public eventually, this is an opportunity to deselect any components containing sensitive information that must be kept private. Deselecting the component from the registration ensures that the content can remain private. If your project includes components, choose the components you want to include in the registration. All components will be selected by default. Verify that the components you selected to be included in the registration are correct. 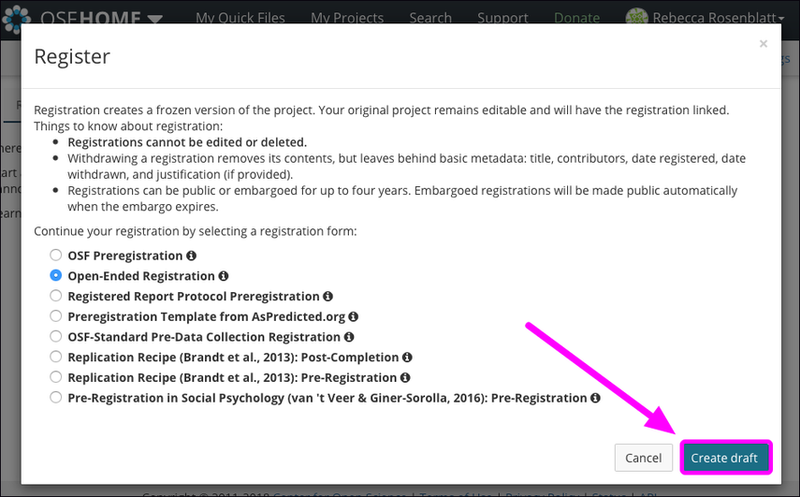 Before you submit your registration, a final modal will appear that allows you to choose your privacy settings. Click inside the "Registration Choice" menu. Then choose to either make your registration public immediately or embargoed for up to 4 years. If entering into an embargo, the "Embargo End Date" field will appear. Click inside the "Embargo End Date" field, then select the date when you want to end the embargo from the calendar. When you're ready to finalize your registration, click the Submit button. The registration will be in a "pending" state until all admins approve the registration or 48 hours pass (whichever comes first). 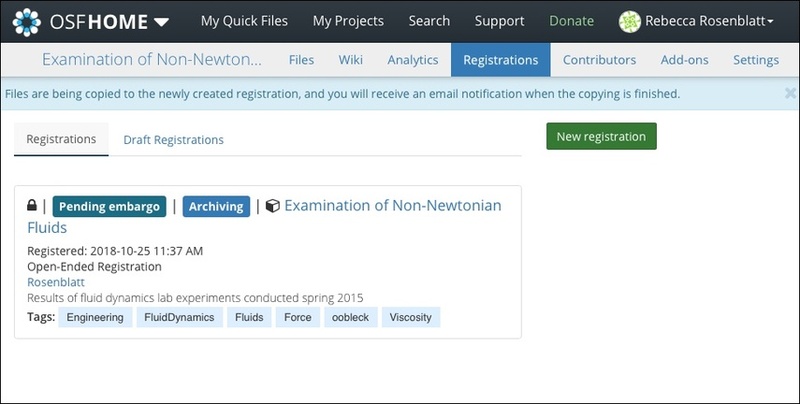 When a project is registered, all administrators on the project are notified via email and given the chance to approve or cancel the registration. If one administrator disapproves the registration, the registration is cancelled. You will be notified via email if an administrator disapproves the registration.